The 2019 Salary Survey Premium Edition is available for immediate download with your purchase of $348. This is your ultimate resource for PR and comms salaries. 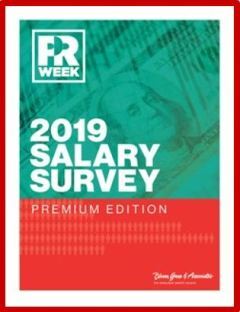 The Premium Edition features expanded content from the 2019 PRWeek/Bloom, Gross & Associates Salary Survey. It gives you access to in-depth insight on trends in salary, compensation, job satisfaction, recruitment, retention, and more. This year’s special edition drills deeper than ever before to reveal data by age range, industry sector, and select cities. Additionally, it includes detailed information pertaining to the gender pay gap, as well as job movement. Purchase our expanded PREMIUM EDITION today and get immediate access! Please indicate which of the following best describes your job title. The charge will appear as Haymarket Media Inc. on your credit card statement. Online access of PRWeek Premium Editions is intended for individual use by the named customer. PRWeek reserves the right to monitor usage, including the source and IP addresses of logins and charge the appropriate license rate if the account is being shared or accessed beyond the named customer.